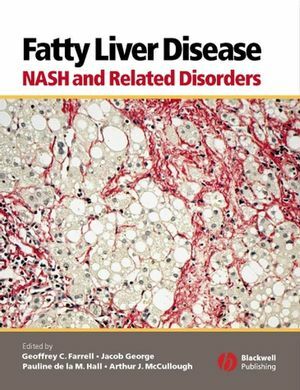 Fatty Liver Diseases: NASH and Related Disorders is an unusual book: it combines a practical approach for students and physicians concerned with the problem with a clear overview on the causative mechanisms. It appeals to doctors and other health care workers who encounter this problem, as well as to pathologists and investigators interested in the field of liver disease. It will improve your diagnostic acumen for people with abnormal liver tests, advance your knowledge about this important subject and help with your specialist or undergraduate exams, and management of a common disorder. Geoffrey Farrell graduated MB BS from the University of Tasmania in 1970, and trained in gastroenterology and hepatology at the Royal Prince Alfred and Royal Brisbane Hospitals, the latter with Lawrie Powell with whom he completed an MD on hepatic drug metabolism. He was awarded an NHMRC CJ Martin Fellowship to conduct post-doctoral research in UCSF, and in 1980 returned to Sydney to establish a Liver Research Group at Westmead Hospital. He was promoted to a personal chair in 1993, then accepted the Storr Chair in Hepatic Medicine. He remained Director of the Storr Liver Unit until Jan 2006, when he accepted the position as Professor of Hepatic Medicine with ANU Medical School and Director of Gastroenterology and Hepatology at The Canberra Hospital. He has held many leadership roles in medical research, gastroenterology, editorial boards, and academic medicine, including Editor-in-Chief of Journal of Gastroenterology and Hepatology since November 2006. Geoff Farrell's research interests are in non-alcoholic steatohepatitis, viral hepatitis, drug-induced liver injury, and liver regeneration. He has published 3 books, including the first on non-alcoholic fatty liver disease, and written more than 180 scientific papers and 100 reviews/chapters and editorials in the fields of hepatology and biochemical pharmacology. His work is very highly cited, with an H-index of 50, more than 20 articles cited >100 times, average citation 32 per paper, and 15 articles being the subject of editorials in major medical journals. He is CIA on an NHMRC Program Grant to study the molecular and cellular basis of liver disease, and has recently held a Centre for Clinical Research Excellence Program grant to improve outcomes for patients with liver disease. Jacob George is the editor of Fatty Liver Disease: NASH and Related Disorders, published by Wiley. Pauline de la M. Hall is the editor of Fatty Liver Disease: NASH and Related Disorders, published by Wiley. Arthur McCullough, MD, is Department Chair of Gastroenterology and Hepatology and a Staff Physician in the Department of Pathobiology and Transplantation Center at Cleveland Clinic. He was appointed in 2006. He attended medical school at SUNY Health Science Center at University Hospital of Syracuse, N.Y. He completed his internship and residency at Cleveland Clinic and a fellowship at Mayo Clinic in Rochester, Minn. He is one of the most senior hepatologists in the United States and is the current President of the American Association for the Study of Liver Diseases. Other significant achievements are: Best Doctor's in America: "Midwest Region" annually from 1996-2008; Chair of the NIH-funded Clinical Research Network on Fatty Liver Disease (federal funding); NIH Grant on Omega 3 Fatty Acids in Diabetes (federal funding); New Novel Agents for Hepatitis C Patients who failed to respond to previous therapy (non-federal funding). 1 Overview: an introduction to NASH and related fatty liver disorders. 2 Pathology of hepatic steatosis, NASH and related conditions. 3 The epidemiology and risk factors of NASH. 4 Insulin resistance in NAFLD: potential mechanisms and therapies. 5 NASH as part of the metabolic (insulin resistance) syndrome. 6 NASH is a genetically determined disease. 7 The pathogenesis of NASH: human studies. 8 Animal models of steatohepatitis. 9 Fatty acid metabolism and lipotoxicity in the pathogenesis of NAFLD/NASH. 10 Cytokines and inflammatory recruitment in NASH: experimental and human studies. 11 Mitochondrial injury and NASH. 12 Cell biology of NASH: fibrosis and cell proliferation. 13 Clinical manifestations and diagnosis of NAFLD. 14 The clinical outcome of NAFLD including cryptogenic cirrhosis. 15 Practical approach to the diagnosis and management of people with fatty liver diseases. 16 Management of NASH: current and future perspectives on treatment. 17 NAFLD, NASH and orthotopic liver transplantation. 18 NAFLD/NASH is not just a ‘Western’ problem: some perspectives on NAFLD/NASH from the East. 20 Steatohepatitis resulting from intestinal bypass. 21 Specific disorders associated with NAFLD. 22 Hepatocellular carcinoma in NAFLD. 23 Does NASH or NAFLD contribute to comorbidity of other liver diseases?. "A superb updated review of a topic of dramatically increasing importance, written by leading authorities in the field. The book is well organised and balanced with excellent homogeneity"
"A comprehensive book of invaluable help in diagnosing and managing NAFLD/NASH. Again, an outstanding source of current data concerning this epidemiologically important problem"
"Fatty Liver Disease is a state-of-the-art textbook coauthored by a number of top-notch experts and should be viewed as an invaluable contribution to the proper management of fatty liver diseases and all its coexisting conditions."